Today’s diesel is the largest and most powerful in the world: the EMD DDA40X! These units were built for Union Pacific, who had a seemingly insatiable appetite for gigantic locomotives. (FEF-3, Challenger, Big Boy, ML-4000, C855, U50, U50C, DD35A, Big Blow Turbines…you get the idea.) The DDA40X was the culmination of this list of power. One class of 47 was built starting in 1969, which was the centenary of the completion of the first transcontinental railroad in 1869. For this reason, the class were nicknamed the ‘Centennials’. On to the all-important specs…these monsters were powered by a pair of GM-EMD 16-645E3A turbocharged two-stroke engines, specially uprated from the standard versions from 3,000 to 3,300 horsepower, giving a combined total output of 6,600 HP. They were geared for a maximum speed of 80 MPH, making them also one of the fastest freight locomotives on UP’s roster. Each unit was 98 feet 5 inches long, rode on two four-axle trucks, and weighed over half a million pounds. They were designed to haul high priority merchandise trains across the system, often bracketed by a pair of similarly geared SD40-2s, leading to the slang ‘Fast Forty Sandwich’. They were used extensively, racking up millions of miles in service. They were stored during the fuel crisis of the 1970s but reactivated in the 1980s for a time. The last units left the roster permanently in mid-1985. 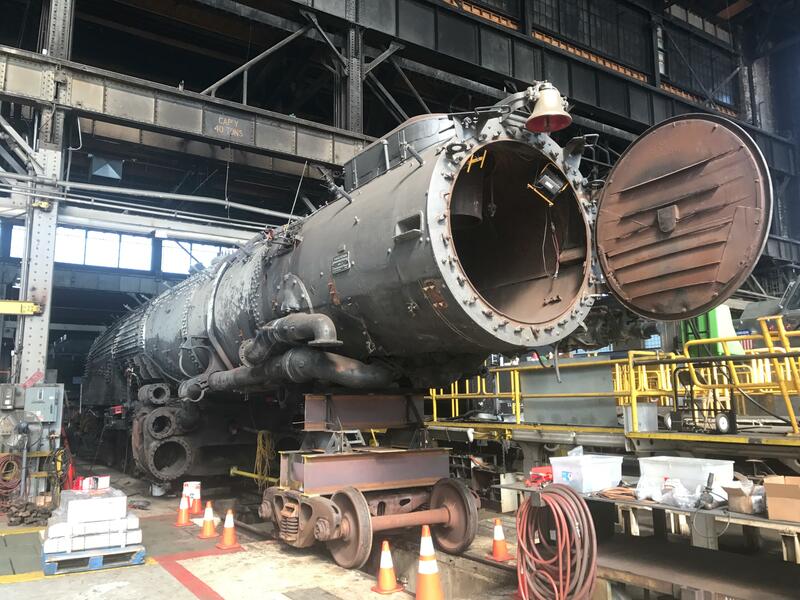 Of the original production of 47 units, 13 survive - 11 static displays in museums, one unrestored shell, and one unit, number 6936, remains fully operational for Union Pacific. The photo today shows 6936 with an executive train somewhere on the western UP system. As an aside, I have visited one of the static display DDA40X units - UP 6916 in Ogden, Utah. That’s me up in the cab, back when I was a wee lad of 20. Speaking of UP’s Big Boy, they’re supposedly on-track (haha!) to complete the restoration of No. 4014 in time to join with No. 844 in Ogden, Utah to celebrate the 150th Golden Spike anniversary (May 2019). @compunaut This is going to be fantastic. I can’t wait, I’ve been following along! @PooltoyWolf We may need to go for my younger son’s birthday; he’s the steam engine fan. @compunaut Oh man, he’d be floored! Here is my Google version of the longest and strongest locomotive I’ve seen pass my home.